Despite coming under heavy criticism from its political opponents for allegedly undermining democracy and the rule of law, the popularity of Poland’s Law and Justice government remains at record levels. Aleks Szczerbiak writes that the government has delivered on its high-profile social spending pledges, strongly opposed the EU’s unpopular migrant relocation scheme, and many Poles feel that it deserves credit for at least trying to tackle the shortcomings of the Polish state. With the opposition failing to mount an effective challenge, the ruling party’s greatest threat comes from a risk of arrogance and complacency developing among its own supporters. Poland’s government – led, since its autumn 2015 election victory, by the right-wing Law and Justice (PiS) party – has come under heavy fire from its political opponents. The government has been accused of creeping authoritarianism and illiberalism, failing to respect the Polish Constitution and separation of powers, and undermining democracy and the rule of law in its approach to the judiciary, media, public appointments and civic rights. Thousands of Poles have participated in anti-government protests and the Law and Justice administration has faced harsh criticism from the EU political establishment and much of the Western opinion-forming media. The European Commission has launched a ‘rule of law’ action under Article 7 of the European treaties, threatening the Polish government with sanctions including possible suspension of the country’s voting rights in the European Council. However, the government’s supporters have robustly denied these allegations, defending its actions as necessary to restore pluralism and balance to institutions which, they argue, have been expropriated by extremely well-entrenched, and often deeply corrupt, post-communist elites. Moreover, in spite of this wave of criticism, Law and Justice has maintained high levels of public support and during the last couple of months the party’s popularity has reached record levels. 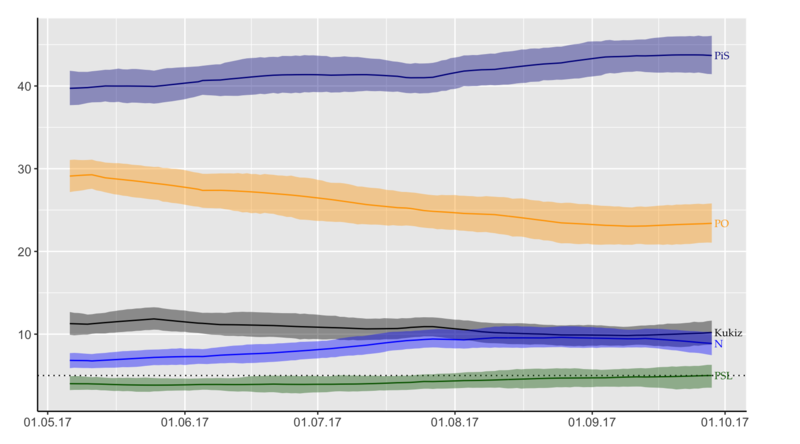 As the ‘Pooling the Poles’ micro-blog that aggregates voting intention surveys shows, Law and Justice (PiS) has a clear poll lead averaging 43% support (in the autumn 2015 election it secured 37.6%) compared with 23% for the centrist Civic Platform (PO), Poland’s ruling party between 2007 and 2015, 10% for the anti-establishment ‘Kukiz ‘15’ grouping, and 9% for the liberal ‘Modern’ (Nowoczesna) party. An October survey by the CBOS polling agency also found that that, at 44%, the number of government supporters was at its highest level since Law and Justice took office; 27% were opposed and 26% neutral. Why is the ruling party so popular? Perhaps most importantly, the government has delivered on several of the high-profile social spending pledges that were the key to its 2015 election success. The most significant of these were its extremely popular flagship ‘500 plus’ child subsidy programme for the first children of poorer households and every second and subsequent child in all families, and a law reversing the previous government’s deeply unpopular pension reforms, which had increased the retirement age to 67 (from 60 for women and 65 for men). The ‘500 plus’ programme in particular has had an important symbolic effect by providing a significant and clearly identifiable financial boost to many low income households who felt frustrated that they had not shared sufficiently in Poland’s recent economic growth. Many Poles feel that, while politicians have often promised to help the less well-off, Law and Justice is the first party to actually deliver on these pledges on such a scale. Moreover, although the government’s social spending programmes are very costly, and its opponents argue that they place a massive strain on public finances, the Polish economy is performing much better than expected. Economic growth is strong, investment increasing, unemployment is at its lowest level for 25 years, wages have started to rise, and increased tax revenues have actually led to a reduction in the state budget deficit. For sure, the government’s critics argue that it is benefiting from a more general upswing in the European economy and a short-term consumption boom rather than increased productivity and private sector investment. The level of public debt remains high and increased social spending could, they say, cause serious problems in the future if there is an economic downturn and the fiscal situation deteriorates. Nonetheless, Poles are more optimistic about the state of both the economy and their personal finances than they have been for many years. The vast majority of Poles also support the Law and Justice government’s strong opposition to the EU’s mandatory re-distribution quotas for Middle Eastern and North African migrants located in Greece and Italy. For example, a May 2017 CBOS survey found that 70% of Poles were against accepting refugees (never mind economic migrants) from Muslim countries and only 25% were in favour. Law and Justice understands that for many Poles the European migration crisis is an issue of huge political and symbolic importance and – in stark contrast to the socially liberal, cosmopolitan consensus that predominates among West European cultural and political elites – they view the EU relocation scheme as a threat to national sovereignty, identity and security. Most Poles are keen to avoid the kind of cultural and security problems that they feel West European countries have experienced through admitting large numbers of Muslim migrants who are seen as difficult to assimilate and embedding violent extremists within their communities. The fact that, unlike in many West European cities, there have been no Islamist terrorist attacks in Poland has increased Poles’ sense that they live in a relatively safe country and they fear that EU-imposed multi-culturalism threatens their security. Moreover, although Poles are still overwhelmingly pro-EU, they are more divided over whether the Union’s institutions should become involved in the country’s internal affairs. Many are sympathetic to Law and Justice’s claim that the Commission’s criticisms of the Polish government are motivated, in part at least, by Warsaw’s rejection of enforced multi-culturalism and, more broadly, by what they see as a hegemonic EU liberal-left consensus in the moral-cultural sphere that undermines Poland’s traditional values and national identity. Interestingly, a June 2017 poll conducted by the IBRiS agency for the ‘Polityka’ journal found that 51% of respondents actually supported leaving the EU if this was the only way to prevent Poland from being forced to admit Muslim migrants. Poland’s liberal and centrist opposition has also failed to mount an effective challenge to Law and Justice. Although many Poles have misgivings about the government’s approach to constitutional issues and civic rights, the strategy of so-called ‘total opposition’, based on exerting pressure through a combination of street protests and international influence, has proved largely ineffective. The opposition has spent too much time focusing on issues that are too abstract for most Poles, while failing to offer an attractive alternative on their more pressing social and economic concerns where Law and Justice is clearly more in tune with public opinion. While he is an effective political operator who has consolidated his grip on the Civic Platform apparatus, party leader Grzegorz Schetyna lacks dynamism and charisma and is constantly being undermined by younger deputies who were close to the previous party leadership. At the same time, a series of gaffes and public relations disasters have allowed government supporters to portray ‘Modern’ leader Ryszard Petru as an over-promoted political lightweight. Moreover, Law and Justice’s election victory also reflected widespread disillusionment with the country’s ruling elite and a strong prevailing mood that it was time for change, and most Poles do not want to see a return to the status quo as it was prior to the election. Although he was not in the party’s inner circle for a number of years before becoming leader, for many voters Schetyna is still associated in the public mind with the previous, discredited Civic Platform administration. The government has also made it difficult for Schetyna’s party to disassociate itself from the negative legacies of its earlier period in office. For example, a special parliamentary commission investigating the 2012 Amber Gold pyramid scheme scandal, as a result of which thousands of Poles lost their savings, has revealed the inadequacies of the state’s oversight systems under Civic Platform’s watch. Similarly, Warsaw mayor, and one of Civic Platform’s deputy leaders, Hanna Gronkiewicz-Waltz, has also caused the party embarrassment by refusing to appear before a special government-appointed verification commission investigating the so-called ‘reprivatisation scandal’: irregularities in the return of properties in the capital confiscated under communist rule. Paradoxically, although it frustrated a key element of the government’s legislative programme, Law and Justice-backed President Andrzej Duda’s July vetoes of two controversial flagship judicial reform bills may also have helped the ruling party, in the short-term at least. By taking the wind out of the opposition’s sails and focusing public attention on debates within the governing camp, the presidential vetoes have both marginalised, and highlighted the weakness and ineffectiveness of the government’s opponents. However, the political ambitions and emotions involved here may be difficult to contain within manageable boundaries and there is a danger that, if this political conflict between the President and ruling party escalates out of control, it could lead to ongoing mutual recriminations within – and even, in the worst case scenario, the implosion of – the governing camp. Some commentators have argued that opinion polls may be over-estimating Law and Justice’s support, or that the party should be performing even better given the state of the economy and level of social transfers. However, the fact that its polling surge has come later in the parliamentary term, rather than as a post-election ‘bounce’ that newly elected parties often enjoy, suggests that it is more deep-rooted. Indeed, even if they disagree with some specific government measures, many Poles still feel that Law and Justice deserves credit for at least trying to tackle some of the apparently intractable problems with, and shortcomings of, the Polish state which had been ignored by previous governments. For example, even many of the government’s critics have praised its attempts to seek redress for ordinary citizens who lost out as a result of the Warsaw reprivatisation scandal. Law and Justice has thus been highly effective at convincing a large number of Poles that, for all its faults, it is at least attempting to make the state more responsive and citizen-friendly and prevent it from being hijacked by well-connected elites and special interests. An important element of this is what some commentators have termed the ‘redistribution of prestige’, whereby many ordinary Poles who previously felt themselves to be second-class citizens have started to regain a sense of dignity and they now feel that their government is finally trying to restore an elementary sense of justice and moral order. In fact, apart from the risk of escalating conflicts within the governing camp, the greatest threat to Law and Justice probably comes from the danger of its own activists succumbing to the kind of arrogance and complacency that led to the downfall of its predecessors, especially if they are seen increasingly as failing to live up to the ethical standards of a party that claims to stand for the moral renewal of the Polish state. So far, the negative publicity surrounding questionable appointments to state-owned companies and agencies, the awarding of contracts to political allies, and appropriation of state resources for partisan ends, has not damaged the ruling party to any great extent; its supporters still regard these as the occasional lapses of a generally honest party. However, experience suggests that an accumulation of apparently minor incidents can gradually chip away at a governing party’s credibility so that when a more serious, high profile scandal emerges it can act as a tipping point and quickly shift the public mood. In spite of recent mishaps, Law and Justice can be grateful that it is still some way off reaching that tipping point. Note: A version of this article appears at Aleks Szczerbiak’s personal blog. The article gives the views of the author, and not the position of EUROPP – European Politics and Policy or the London School of Economics. This was a pretty valiant effort at being even-handed – and a million times better than almost every other article I have seen written in the Western press BUT … the author skims over 3 major issues and misses out another one entirely. Firstly, which companies are outperforming the rest? Secondly, irregularities in the property restitution? Just that? Thirdly, deliberate mismanagement of state companies under the Liberals with the aim being to achieve cheap privatizations of state-owned commercial companies. 1&3 I’ll answer together: State companies like LOT, the national airline were deliberately taken to the brink of bankruptcy, shoulders were raised; “Nothing can be done to save them” said Tusk. Wrong, the Liberals lost the election and LOT immediately started posting record profits!! I have inside knowledge of this, as I count two pilots among my friends. In fact, one had cornered a minister some time back – in his plane (!! ), asking him to take specific actions. But no. Astonishingly, the Liberals helped set up a rival budget airline OLT specifically to cause LOT’s demise (without any hope of OLT ever making a profit). Funding for OLT came from, initially Amber Gold, then Air Berlin!! Air Berlin? Why, oh why would they do that??? I’ll let you guess. But the Liberals losing the election and LOT recovering, meant that Air Berlin went bust … thanks to that dodgy loan. Too funny for words!! Property restitution. The Commies stole loads of real estate after the war, not only in Poland. Every other country simply handed it back, but Poland’s Communists were the best prepared of all the regimes and had colonized the upper echelons of Solidarity. Lech Walesa was an agent, remember? Anyway, to get your proerty back you had to prove the Commies didn’t follow due procedure when stealing it. Holding the documents was City Hall – infested by post-Communist bureaucrats. They said all documents were lost or incomplete – so there was no hope. Tusk brought in legislation enabling property claims to be sold. City Hall set up private property claims companies and Lo and Behold! All documentation was found, judges immediately signed on the dotted line and one billion euros in profit immediately made in Warsaw alone. This was repeated across all big cities in Poland – all run by the Liberals. 55,000 low end tenants were evicted in Warsaw alone as part of the scam. One tenant refused to go – Jolanta Brzeska – so she was murdered and her body set on fire. The corrupt police initially tried to say it was suicide – the only corpse to try to self-immolate. On a final note – the TV media before 2015 were all entirely wedded to the Liberals and were all friends and family of the ancien regime. A bit like the Dimblebys in Britain, but with a twist – sort of as if they were all related to Myra Hindley or Peter Sutcliffe. The Communists murdered people, remember? Our diplomats are best summed up by our top posting – Ryszard Sznepf (Washington). His dad was the Soviet KGB officer in charge of repression at Warsaw University!! Our highest profile writers were linked to torturers!! Seen the film Ida? It’s based on the monstrous thug, turned author Julia Brystigier. And our film industry churned out yet more Holocaust films, obviously showing Poles to be the real culprits. 6 million Polish citizens died during the war, half of them ethnic Jews, half ethnic Poles (who apparently still found down time to go out hunting down Jews). Conspiracies do exist but you need to provide some proof. As for ” holocaust films”…It’s none of your business what writers write about, what artists paint and what film makers make…And yes many Jewish Poles were hunted. There was also brave Poles who protected Polish Jews but those who were more than too passive and scared to help out but active anti Jews were numerous. What are you talking about being “too passive and scared”? Jesus F Christ! No other nation was as awarded by Yad Vashem with “Righteous Among the Nations” for saving Jews. Let me remind you that inf France, for helping jews, the only punishment was financial one, while in Poland saving Jews was punished by death. A political party does some things it promises to do, and opposes policies many people dislike. Then it stays pretty popular.